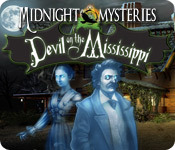 Midnight Mysteries 3: Devil on the Mississippi is rated 4.4 out of 5 by 58. Rated 5 out of 5 by Tikatoy from Another strong entry in this series This is an excellent HOG with beautiful graphics and animations, a variety of fun puzzles and a great story. There are also some great, spooky effects and some genuine shocks along the way. You explore varied locations (scattered throughout the US and England) at different points in time and meet numerous ghosts; some of whom are truly menacing (although the scariest ones may have been children!) But what I like best about this game (and the two earlier ones in the series) is how there are two separate but intertwined storylines and how the parallels and connections between them are revealed along the way. You are given dialogue options when you talk to different characters in the game and it makes you feel more involved. The story is very inventive, for sure, and the strongest part of the game--quite a feat given how high quality the other aspects of the game are. You get more hints by finding ravens throughout the game, and there is also an optional task of looking for clovers. Some of these are quite well hidden! You get special trophies for finding all of the ravens and all of the clovers, and I enjoyed these extra challenges. The puzzles were a lot of fun and included some types that I haven't seen in other HOGs. They was a good variety of them and all are skippable after some time has elapsed. I especially liked the one that was a bit like Battleship (E4!) but with a logic aspect to it so it isn't just random guessing. (This is a dressed up nonogram.) This is a great HOG, and I really appreciated the original storyline and its wonderful brew of historical and literary fiction. Rated 5 out of 5 by andreakysor from A must have for fans of Mark Twain!!! The reason why I decided to play this game was because I am a huge fan of the writings of Mark Twain (Samuel Clemens). This game did not disappoint me. I loved that you were able to interact with characters from some of his most famous writings and also other historical characters. The only downside to this game for me was the level of challange. Some of the puzzles were just to easy and obvious to figure out. I loved this game and I am already replaying it. Rated 5 out of 5 by Lao_Zi from Yummy! A delicious game Midnight Mysteries is a good series, and this particular installment is absolutely TOPS. It has it all... excellent graphics in a lot of different scenes, spooky atmosphere with a storyline to make your mouth water, challenging puzzles... I found it as enjoyable as reading a good detective novel. By the way, I particularly liked the funny twist with all the historical characters appearing as ghosts. Do I recommend this game? Yes, yes, YES! Devil on the Mississippi definitely is one of the games on my play-again-list. Rated 5 out of 5 by desertsprings from my favorite game this is a great game which i was sorry to see end....the first time i have found the story line of a game to be of interest. great graphics and atmosphere. 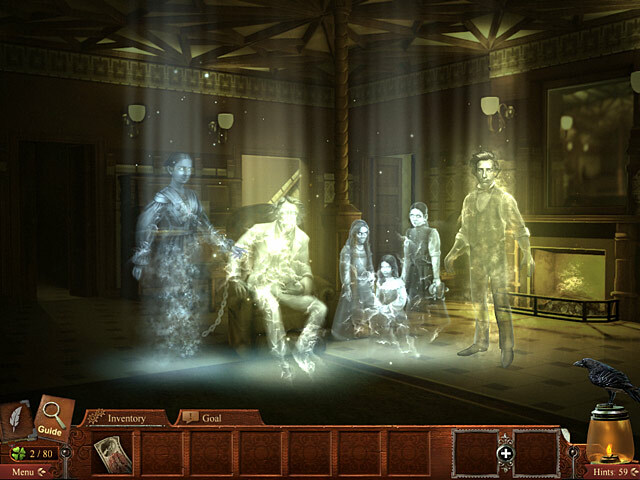 Rated 5 out of 5 by GrrlScientist from as you like it: gorgeous graphics and ghostly writers in this hidden object puzzle mystery, Mark Twain’s ghost has come to you seeking help. a wise choice, seeing as how you are an accomplished investigator with a passion for the paranormal. Mark Twain is asking your help discovering the true identity of Shakespeare -- a question that grips the literary world to this very day and that has awakened the interest of an evil spirit. this evil spirit (a disgruntled literary critic?) will do what he can to keep you and Mark Twain from accomplishing this task -- which becomes more complicated the further you pursue this investigation. graphics: like all the games in this series, the graphics are absolutely gorgeous; wonderfully detailed, crisp, carefully presented and designed. the art is lovely, if a bit foreboding, and made me want to simply look around. the hidden objects scenes are so refreshingly tidy; i am pleased that i didn't run across the usual junk piles. however, if you think a tidy scene makes it easier to find hidden objects, well ... think again! some of these items are very cleverly hidden “in plain sight”! 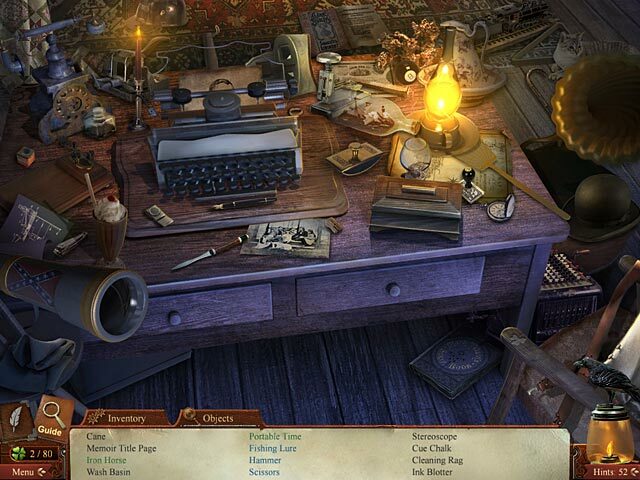 further, hidden object scenes included mini-games where you combined two objects to create one hidden object on your search list. there is a nice combination of hidden objects scenes and puzzles. puzzles include memory, spatial and matching mini-games, some of which i've not seen before in the many games i've played. music and sound effects: music is appropriate and the sound effects were quite nice, setting the mood well. i was a bit confused at first when i heard a recording of baby birds (sounded like chickadees to me) begging for food -- then i realised the game developers were using that sound whenever bats were flying about. uh, ok! storyline: interesting, became progressively more convoluted (perhaps a tad *too* convoluted for a strong video game storyline?). included historical (educational) details. conversations with various ghosts indicated what you were supposed to do next, provided context and moved the story along. gameplay: no map, although there is a journal. smooth transition between scenes and no cursor hiccups or freezes. not much back-and-forth. there is no click penalty and puzzles can be skipped. hints are wonderfully detailed and can function as a walkthrough or mini-strategy guide. ravens and four-leaf clovers adorn many scenes and are collectable: each raven gives you another hint whilst the clovers unlock unlimited hidden object gameplay if you collect at least 40 of the 70 in the regular game. achievements are awarded, which as always, improves replayability. in addition to ghosts, this game also included time-travel. as a bookworm, i absolutely loved the references to Mark Twain and Shakespeare. these references made me wonder if teens who are reading these books for the first time in school might find a special appeal in this game? although there's plenty of thought involved in this game, it's not so difficult that you give up in frustration. the convoluted storyline is the reason i gave this game 4.5 stars (rounded up to 5 stars), although i do highly recommend it. as for me, my biggest challenge is deciding which to purchase: CE or SE? Rated 5 out of 5 by themare from Incredible Graphics! This has become one of my favorite games. The opening scene is fantastic and the story line is really interesting. I highly recommend this game! Rated 5 out of 5 by Prometheusway from A Devilish Pleasure This game was a pleasure to play! The puzzles are challenging enough to keep you trying -- truly works your mind; the story line was great, the hidden objects adequate the atmosphere and graphics were awesome. I highly recommend the game, as I do all the other Midnight Mysteries. The series gets better with each game. Rated 5 out of 5 by skye73 from "VERY COOL GAME" This game is great! I was not dissapointed at all, well other than the plot being a little out of my league. But on a good note, I actually learned a few things from this game :) Make sure you play with all the sounds cranked!! and the lights off!!! Enjoy everyone!!!! Rated 5 out of 5 by BlueOctober from Great Game! I have almost NO idea what the story was about. I really couldn't follow it. I think it was about Mark Twain trying to get his soul back or something...I'm not sure. Somehow Shakespeare is involved. Who knows...it's kind of convoluted...BUT....this game was great! The scenes were gorgeous, the puzzles were just challenging enough. The game even startled me a few times, which was fun! I definitely recommend this one! Rated 5 out of 5 by bep1 from A Quality Game Very interesting game. Nice visuals, interesting story, not too hard. I liked that if you found all the 4-leaf clovers, it unlocks another mode, but I wasn't able to find them all. I did find the story a little hard to follow, but that was probably just me. Rated 5 out of 5 by wastephe from liked the game a lot always like the midnight Mysteries games! this one will not disappoint. Rated 5 out of 5 by jxnfan from Midnight Mysteries 3: Devil on the Mississippi Dark and mysterious! Love Mark Twain's ghost! Rated 5 out of 5 by LEIZAP from Love this game! Beautiful artwork, nice background sound and music, great blend of HO's and puzzles and interesting storyline... what's not to love!!! And with the achievements, it has replay value! My only regret... I didn't buy the CE!!! Rated 5 out of 5 by bunnyrn from Excellent game! This game kept me hopping the whole time. The graphics are amazing. The interactiveness of the puzzles had me on my toes. I hate to hit the "skip" button, but I have to admit I did once. It would have been nice to get an explanation of how the puzzles were to be worked out, but with a little bit of thinking, they turned out just fine. My heart did a "whoa!" a few times when "things" jumped out of the screen at me. I really liked that. I would highly recommend this game to everyone! Rated 5 out of 5 by josey1pr from Super cool 3D picture and sound you need to play this game is not more of the same real cool. Rated 5 out of 5 by cyclonetracey65 from EXCEPTIONALLY GOOD!!! I thoroughly enjoyed this game and it was educational as well. I had no idea Mark Twain's real name was Samuel Clemens. The story was great, the way it was tied into both fact and fantasy. The puzzels aren't hard at all, but it is fun and thoroughly entertaining and having only paid $3.99 for it a bargain to boot. While it is educational it is not for the kiddies does contain dark themes and not just the Faustain ones. Rated 5 out of 5 by mpg1 from Great Game!! I loved this game!! Grapics clear, not to dark. HO clear & not to small.No map & you do move around a bit, if your stuck the hint button will show which direction to go with arrows. The puzzles were different then any I have played, challenging, but not super hard. Hints recovers quickly. If you find 70 of an object, you get to play a bonus type of game.This game really holds your interest. The story line is almost believeable. Rated 5 out of 5 by lindiana from Fantastic game! I did not think I would find a HOG game to replace my favorite but this one does. The graphics are amazing. The story line keeps you fully engaged and wanting to keep going. And the game is educational without being preachy. This game gets an A+ from me. I'm going to look into the previous releases of the series as well. Rated 5 out of 5 by booksnspurs from Intriguing Mystery I also love this literature themed series. The story kept me interested until the very end. The game reminded me more of the larger adventure games that involve dialog with the characters, but it’s only a limited amount per character (some games can get pretty gabby). I really enjoyed all the ghostly characters that you bump into. I thought the game was on the easier side, but I like that occasionally. Not a lot of running around or backtracking, the hidden objects were easy to find and I didn’t need to skip any puzzles. The hint button pretty much told you what to do and where to go next. Overall I thought it was a nice relaxing, creepy game with an intriguing storyline. Rated 5 out of 5 by solarmom from first game EVER to have enough fun to finish!! The sights, the sounds, the element of surprise...,this game HAD me!! My daughter and I were playing and when we finished a task all of a sudden this "BAM!" and lighting flashed, a "spirit" flashed across the screen and we were both "eeeeeck!!" what was that!!??? scared the pants off of us!! we need more games with this kind of surprise!!! Rated 5 out of 5 by sleepiswrong from I love these games! Midnight Mysteries is quickly becoming my favorite casual game series. Every game I have played has been worth downloading. I love that they've added awards, it gives the game even more replayability (is that a word? lol# than before. This one was creepier than previous games in the series, in my opinion #which I like). It ran beautifully on my computer- no glitches, no stutters. It had just enough of a challenge- not frustratingly difficult, not boringly easy. Even writing this review I'm thinking about playing it again when I get some free time! 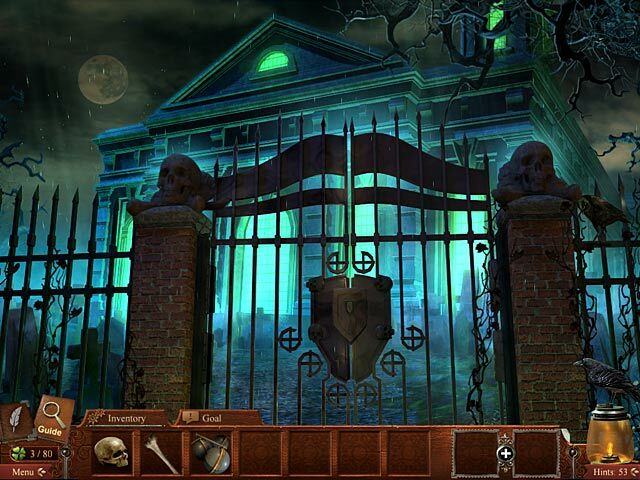 I highly recommend all of the Midnight Mysteries games! Rated 4 out of 5 by Italia47 from Oh those bones...oh those skeleton bones! Pretty good SE game. Collected lots of raven hints and 50 out of 70 clovers which were pretty hard to detect in some scenes. Not too bad or too hard of a game. Very interesting storyline and creepy scenes, bleak in lots of areas and grainy objects here n' there, but very good artwork. No map, which would have made life easier, but a good raven hint button if you needed it. Some of the puzzles were puzzling but very clever and quite different. I would recommend this game. Rated 4 out of 5 by neilskinut from good not great I have played the others and there are all about the same. Have to keep remembering to combine clues to use them. Lots of moving all around. I like voice overs and not all the reading.